Are you preparing for competitive exams? Then, our website is the best place, where you can get all Study Material which will make your preparation easy. To make the candidate’s preparation more effective, we have provided GK Questions on various topics on our website. 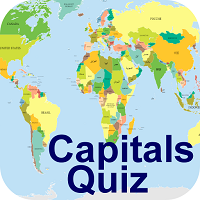 On this page, we have mentioned a list of all Countries and their Capitals. We have also provided Capitals for each State of India below. Therefore, go through this article, and get a grip on the Countries and Capitals of the World. So, go through this article and improve your knowledge on the General Awareness. Therefore, the list of Countries & their Capitals and States and Capitals of India have been provided in the above table. So, the candidates must have a look at this complete article and must test their knowledge. To improve your knowledge of the General Awareness topics, visit our GK Page, where you get detailed information about all the different topics of the General Knowledge.